"This is the last time I take you to tour a rum distillery." she said. I think she means it. 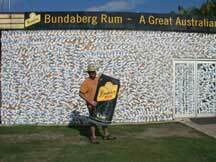 Bundaberg is known for its rum. Except for a 3 year period just pre-WWII when it was shutdown for a massive fire, it has been in operation since 1888 supplying Aussies with a variety of molasses-based alcoholic beverages. The fire is still with us in the form of draconian regulations for the tour-ists. Anything capable of producing electrical current is prohibited. Cameras, mobile phones, watches, pacemakers. I made up that last one, but I wouldn't be surprised if someone on staff thought of it and was shot down by the lawyers. So we couldn't document this amazing place in pictures. It is a chemical factory, in essence, and looks the part with a few remarkable exceptions. They can't produce molasses for half the year, so they store it in a large well. Up t 5 million litres. We got to walk over the large sea of molasses, bubbling from its own internal heat. You could snorkel it (and I bet you'd find something down there), but the ticket has something about asking you to leave if you do. If they're adamant about not allowing open shoes of any kind, I think they'd look askance at full-body immersion in their raw material. I was one of only a couple people to memorize the name of the common yeast used in the fermentation process. They promised me a prize in the gift shop. By law they must age the rum for 2 years. This they do in massive vats constructed of Appalachian White Oak trees. Each vat can hold 90,000 litres and they have over 300 of them. That's a lot of rum. Tasting time arrived and I opted for their liquer and milk. Yum! I had another in quick succession and was quickly soused. I introduced myself as Dan Schnoker. My prize was a 4 foot tall plastic cutout of a Bundy Rum+Cola can. It fits the inside of our van's windshield and we'll use it for a sunscreen. Life has truly slowed down. Mostly out of the necessity not to overheat by doing too much, or moving too fast and suffering terrible heat rashes (they are!). But folks seem more calm, stores close up at 5pm each night. There is less rush, less traffic, less panic. More addition and love, less subtraction and destruction. That is the gist of what the woman standing next to me said. We were all watching the giant turle mama lay her eggs in the sand. She said the world needs more love, less war. Maybe we too can learn something from the natural world? I find absolute joy in the simplest tasks these days: the purchase of a fresh bag of ice, an air conditioned hallway, a cold drink. Even the thought of laundry totally excited. We had a great dinner last night in a local Indian Restauraunt, the proprietor of which was a 5th generation Australian-Indian who still sends her 2 sons back to Punjab for the summers. She also had an arranged marriage. I'm amazed at how resilient and strong the culture appears to be, but am also amazed at the isolation it must endure.